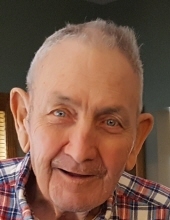 Richard Lee Foresman, 83, passed away peacefully on March 22, 2019 at the Rowley Masonic Home in Perry, Iowa where he lived since 2015. He was born in Guthrie Center, Iowa, January 16, 1936. Born to Oscar and Anne (Nelson) Foresman, he was the second of five children. Richard attended Guthrie Center schools until he enlisted in the US Army to serve his country for nearly 11 years. He was stationed in several bases including Tacoma, WA and Anchorage, Alaska, as well as Germany and Korea. He was honorably discharged as a Sergeant in 1966, and began the next chapter of life as a farmer in Audubon County. On November 14, 1959, he married Ina Mae Carlson at the Presbyterian Church in Audubon, Iowa. Together they raised their family of five on their farmstead east of Audubon. Richard was an active member of the community. He served on the Audubon High School Booster Club, Farm Bureau and Soil Conservation District boards, and was a member of the Lions Club. He and Ina were the biggest supporters of their family at every sporting event, recital and activity. After Ina’s death in 1987, Richard married Ardyth Bertelsen. They operated a craft shop and traveled extensively. He was a master of many things from cards to carpentry to farming. He enjoyed horseback riding, fishing, his black labs, and hunting. He also enjoyed escaping the Iowa winters in his RV spending time with his siblings in warmer climates. He loved the occasional casino visit, as well as family outings on his boat. He was a committed, loving family man who loved the sound of laughter, the telling of a good story, a trip down memory lane and a loving hug or smile from his grandchildren. He touched the lives of so many. His sparkling blue eyes could light up a room and bring a smile to anyone lucky enough to be by his side. His light will remain in the stories and laughter that we share and in the eyes and hearts of the loved ones and legacy he leaves behind. Richard is survived by his daughters Lori (Paul) Foresman-Kirpes, Vicky (Jen) Foresman all of West Des Moines, Cynthia (Chad) Filean of McKinney, TX; Kathy (Joe) Walsh of Niles, IL; his grandchildren, Carl (Nicole) Kirpes of Findlay, OH; Jake Kirpes, Breanna Kirpes, Kaylee Kirpes all of West Des Moines; Olivia Filean, Samuel Filean, Jackson Filean, Cecelia Filean of McKinney, TX; Allison Walsh and Abigail Walsh of Niles, IL; his siblings Donna Klever of Columbia City, OR; Doris (Darrell) Sloss, of Portland, OR; Henrietta Rubino of Garden Grove, CA; Peter (Deb) Foresman of Estacada, OR; sister-in-law Judy Gates of Sonora, CA; and numerous nieces and nephews. He was preceded in death by his wife Ina Mae, his son Rodney Lee, and brothers-in-law Howard Klever, Ed Rubino, Chuck Gates, and sister-in-law Ellen Carlson. Richard was surrounded by family and loving caregivers during the last days of his life. Some people come into our lives, leaving footprints on our hearts and our lives are never, ever the same. Special thanks to all the caregivers and volunteers at Rowley and Kindred Hospice for their dedication, care, and support during his time there. The family will meet with friends Tuesday afternoon, March 26, 2019, from 12:30 p.m. until the time of the service at the First United Methodist Church in Audubon, Iowa. Funeral services will be conducted by Pastor Kathy Kluis and Pastor Mike Divis on Tuesday afternoon at 2:00 p.m. at the First United Methodist Church in Audubon. Interment will be in the Arlington Heights Cemetery in Audubon. The honorary casket bearers will be Joe Walsh, Peter Foresman, Randy Gates, Rick Gates, and Darrell Sloss. The casket bearers will be Paul Kirpes, Carl Kirpes, Jake Kirpes, Chad Filean, Sam Filean, and Jack Filean. Memorials may be directed to the family at 312 31st Street, West Des Moines, IA 50265 to establish a remembrance of Richard’s life. To plant a tree in memory of Richard Lee Foresman, please visit our Tribute Store. "Email Address" would like to share the life celebration of Richard Lee Foresman. Click on the "link" to go to share a favorite memory or leave a condolence message for the family.